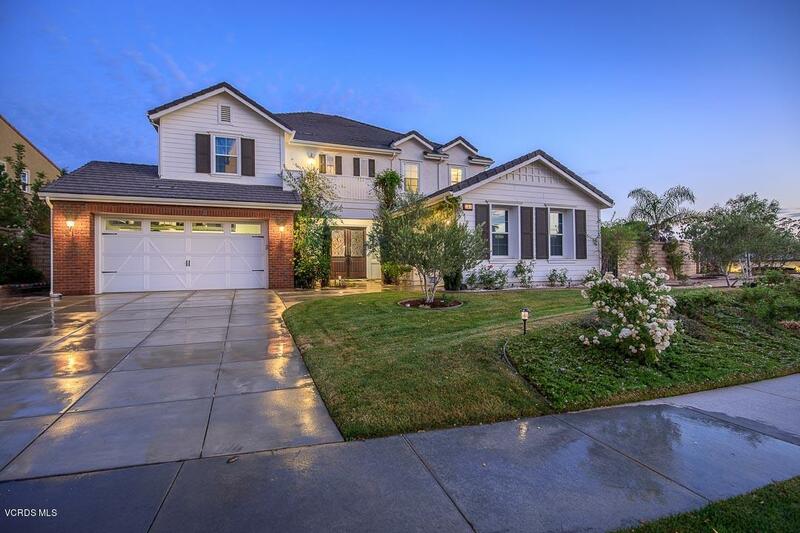 Welcome to this spectacular 4 bedroom, 4.5 bathroom, 4, 077 sqft home in the gated Pinnacles at Moorpark Highlands! Step into the grand foyer with sweeping dual staircase, spiral chandelier, and Carrara marble porcelain tile floors. The tile floor carries throughout the lower level connecting the light & bright formal dining room, formal living room, and bonus office. Step into the modern chef's kitchen with beautiful dark cabinets contrasted by white stone counters. The kitchen boasts high end stainless steel appliances, huge island, and a walk in pantry. Adjacent family room is designed for entertaining with a bar, sleek built in media cabinets, and lanai door that creates a seamless flow from indoor to outdoor living. Desirable floor plan has downstairs bedroom with ensuite. Upstairs open the double doors to the master bedroom with an oversized sitting area, huge windows, and designer carpet. The master bath has separate vanities, a sunken tub with view of the mountains, a walk in shower, and huge walk in closet. 2 good sized secondary bedrooms both have en-suites. The backyard is perfect for relaxing with gorgeous landscaping, covered patio, and firepit positioned for watching the sunset. This is the one you've been waiting for! Welcome home!